Richard Browne has joined Insite360 business as Growth and Business Development Leader. A fuel and c-store veteran and contributor to multiple trade groups, Browne will support Insite360’s continued growth. October 2, 2018 – Houston, TX – Insite360 announces the launch of DeliveryInsite, a fuel logistics solution that significantly enhances current fuel dispatch and reconciliation processes. If you attended the Retail Fuel and Technology Conference in Myrtle Beach this year, you are eligible for the following special. If you have any questions or would like to take advantage of this special pricing, please contact Amit Kumar ( amit.kumar@gilbarco.com). Attending the Retail & Fuel Technology Conference in May could be the best financial decision you make this year. 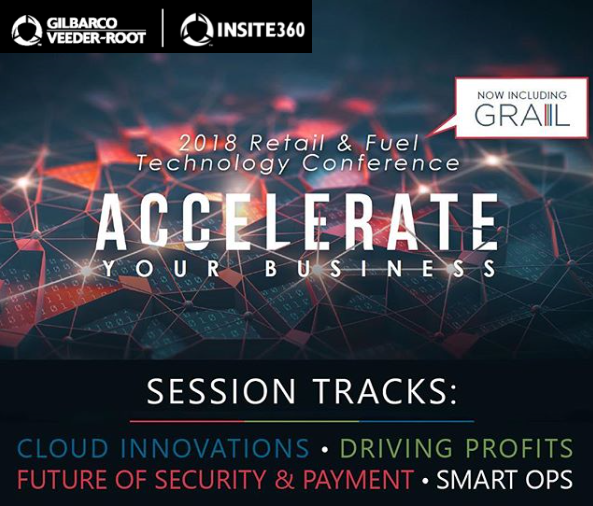 Gilbarco Veeder-Root and Insite360 will spend two days covering helpful ideas on how to leverage technology to stay ahead of your competition. You'll not only learn about new features and best practices for Insite360 Fuel, Encore and Passport products - you'll gain insight into fuel variance, fuel supply & pricing, fuel sourcing, EPA regulations and fuel financial reconciliation. We know you’ll return home with helpful tips and ideas on how to best use Insite360 software and services to stay competitive. Insite360 Fuel Center® is a 24/7 fuel management service for companies who wish to reduce fuel costs – typically 4 to 6 cents per gallon – and gain greater visibility in a volatile fuel market. Fuel Center optimizes and directs all fuel management activities from supplier and distributor selection, demand forecasting and procurement to dispatching, delivery and invoice reconciliation. With its team of fuel experts and industry-leading fuel management software, Fuel Center enables a supplier-independent, fuel procurement and management strategy. Take charge of Your Fuel Deliveries with the new Insite360 Carrier Communications Portal and Delivery Insite, you can now easily track your fuel from the exact moment it's picked up until the moment it's delivered. Do you have multiple alarms that you monitor on a daily basis? For better visibility into your ATG alarms, you can export them into an Excel or PDF format for easy review with your team. Go beyond the dashboard to export, save and share data that can enhance your operations. Being able to quickly see your critical, open alarms is a huge benefit of Insite360 Visibility Dashboard. You can access open alarms via the Dashboard, but you can also view in a report format. This quick tip will show you how to access and export the Alarm Details report.